On each projector there are labeled indicator lights that can be used to diagnose problems. flashing red light by lamp indicates the lamp is reaching the end of its usable life and must be replaced soon. A SOLID red light indicates that the lamp is burnt out and must be replaced immediately. "PLEASE CLEAN FILTER" prompt appears after the projector has been used for 500 hours. and message will will appear on the screen for several seconds after the projector is turned on and then disappear. The projector will still function with a dirty filter. Â¡ÃÆÃ¢â¬Å¡ÃâÃÂ when 100 hours remain on the lamp. This message will be displayed until the lamp has been replaced. Located in multiple academic buildings. Indicator lights are located at the front of the projector and are labeled LAMP 1, LAMP 2, and TEMP. Solid red light by lamp indicates the lamp is reaching the end of its usable life and must be replaced soon. 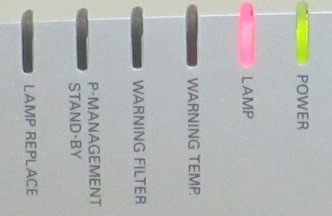 A flashing red light indicates that the lamp is burnt out and must be replaced immediately. Panasonic projector will display the message, "PLEASE CLEAN FILTER" and the the indicator light by TEMP will turn red and flash once when the filter needs to be cleaned. The projector will still function with a dirty filter.